I’m no big fan of Destiny. I think the game was a middling RPG (though a pretty good shooter!) that became more about the grind than the actual game. Of course, there are many people who love the hell out of it, including our own Darryn – who’s spent too much time with Destiny instead of training up his Mortal Kombat X skills. I digress. I’m not a fan of Destiny – but I am a fan of people who put their money where their mouths are. Bungie and the people playing their game have raised over a million Dollars to help people affected by April’s devastating Earthquake. 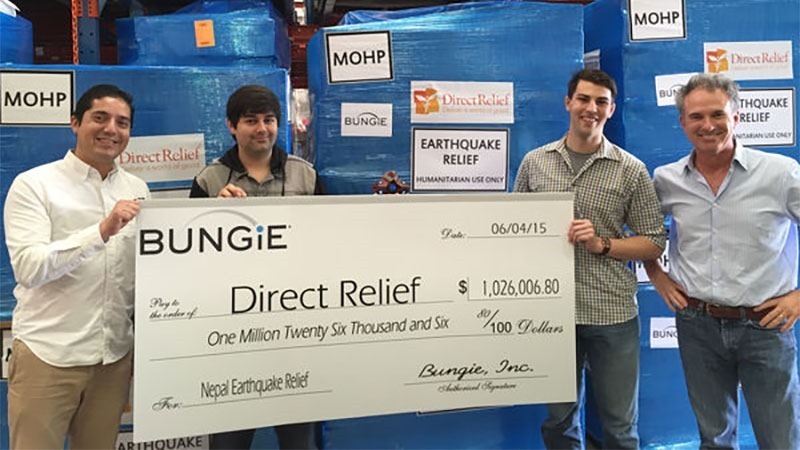 “This was an astounding act of generosity on the part of Bungie and the larger Bungie community, and we at Direct Relief are deeply grateful – beyond what can be expressed in words,” said Thomas Tighe, of Direct Relief. Destiny players raised this money by buying an overpriced Destiny T-Shirt along with an in-game exclusive armour shader, with Bungie and Activision each throwing in $50 000. The shirt cost $30, with Bungie giving $15 of that to charity. That’s a heck of a lot of Destiny shirts. While playing Destiny is a digital grind, rebuilding a country devastated by earthquakes is a real world one, which should hopefully be just a little bit easier thanks to the altruism of Earth’s last Guardians. Previous article Hail, Michael Fassbender! It's the first pulse-pounding trailer for MACBETH! Next article Diversity is great – but do we run the risk of tokenism?